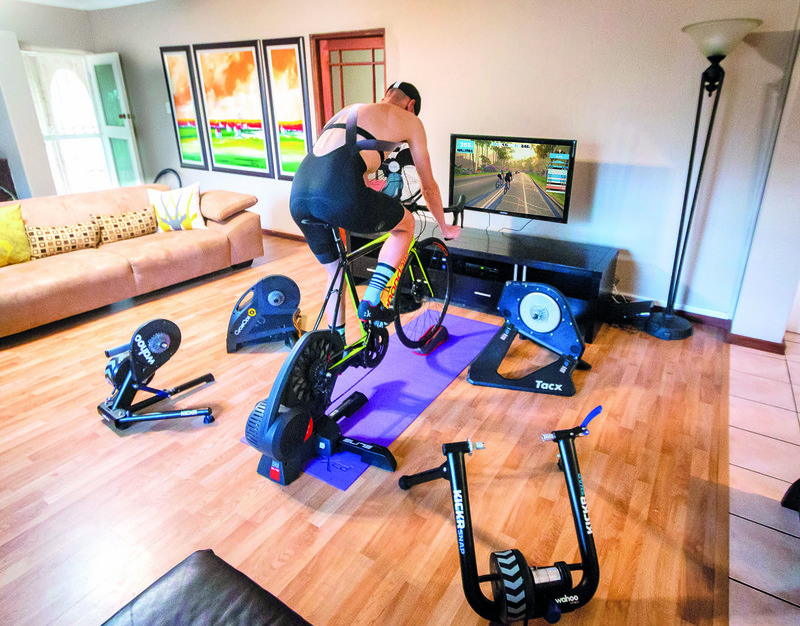 With a broken radius, complete elbow dislocation, and a ruptured ligament sheath, this cyclist decided to keep strong with Zwift and his indoor trainer. There I was: a mangled pile of flesh and bones strewn across the cold, hard gravel, after a mass pile-up sent me over my handlebars at 40km/h. And judging by the grinding sound from my left arm as I tried to get back on my bike, something was very wrong. Good guess – my arm was wrecked. Race over. After four hours of agony and a cocktail of painkillers, eventually I was carted off and assessed by a specialist at the Netcare Blaauwberg Hospital in Cape Town. He confirmed the inevitable: a broken radius, complete elbow dislocation, and ruptured ligament sheath. In terms of arm injuries, it doesn’t get any worse, and the look on his face confirmed the severity of my situation. Talk about a buzz kill. Thankfully, the long-term prognosis was good; and the doctor hadn’t said anything about stationary bikes – an invention which up until this point I’d avoided like the plague. However, before plotting my comeback I first had to endure a 12-hour vomit marathon, a known side effect of anaesthesia. Could things get any worse? My friends and family say I’m crazy. My wife says I’m incredibly dedicated and committed. I don’t know who to believe, but I will admit I’m mildly obsessive when it comes to most things I do – especially riding my bicycle. See, back in 2013 I was very unfit. I weighed 85kg, and did little in the way of exercise. But all that changed after my colleagues at work coerced me into buying a bicycle. A few weeks before my accident I’d come across an online article about Zwift – an interactive cycling application that mimics riding outside, via a smart trainer and screen, allowing you to train and race against people from all over the world in the comfort of your own home. I was intrigued, but hadn’t really paid it much attention – until now. Now, I downloaded the Zwift app, and began to plot my strategy for (as the doc had put it) the next six to eight weeks. Little did I know it would become my life. But to start, I had just one small issue – no indoor trainer. Thankfully, Dennis Lamminga, a good friend of mine, loaned me his smart trainer for the duration of my rehab. So after just 24 hours, I was back on the ‘bike’, jostling my way through a pixel-based world of cyclists in a land known as Watopia. And my mind was blown. This wasn’t just pedalling aimlessly on a stationary bicycle. Oh no; it was far more than that. This felt real. So did the climbs and descents, as my trainer increased and reduced its resistance based on the virtual terrain that lay ahead. After 30 minutes, I was spent – it felt like I’d done two hours. Session one of 41, completed. Day after day, I spent the early hours of every morning before work toiling away by myself, sticking to my training plan, completing every session. The efforts felt harder than I was used to, the sessions longer – no free miles here. was originally prescribed, and stuck to my hours. Not for the first time, I was told I was crazy. The comments on my Strava rides were largely positive, but the odd ‘you’re nuts’ and ‘you need to rest’ in between were my motivation to keep chipping away every day. I completed every session. Week one became week three, then four; and suddenly, there I was in week seven. Sure, I felt stronger and more determined – but deep down, strangely, I was struggling with the thought of riding outdoors again. The notion of racing made me even more anxious. I replayed my crash over and over in my head, wondering what I could have done differently. I began to look back at other races too, particularly road races where I‘d taken risks. 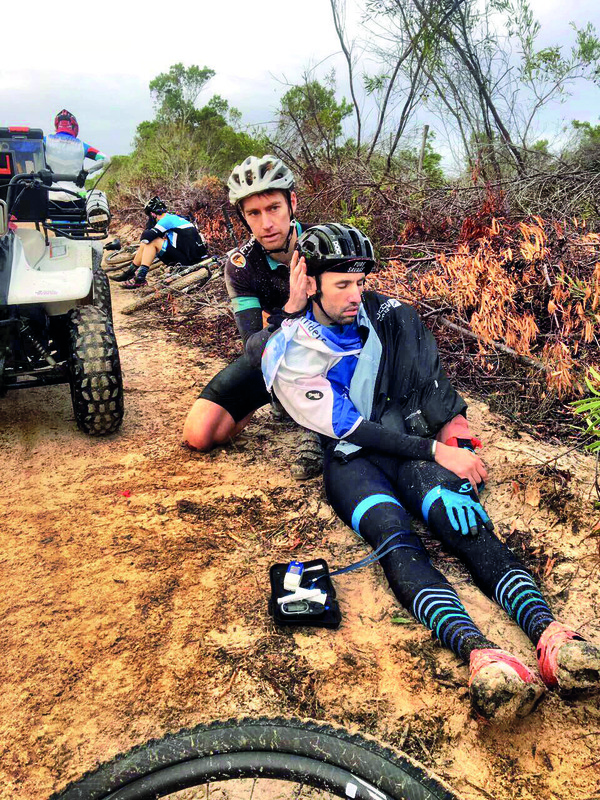 I began to realise the dangerous situations we confront on a daily basis as cyclists, all in an effort to ride harder and faster than the guy next to us. And for what – kudos and bragging rights? But cycling’s addictive. Maybe it’s the pain or the rush of endorphins after finishing a race or key interval set that keeps me – and you – coming back for more. I know that for me it’s an outlet, a form of escapism from the stressors of reality. I mean, who in their right mind spends seven weeks smashing intervals by themselves… indoors? Turns out I’m not alone. Many amateur and professional riders use Zwift as a training tool for this very reason. Take Matty Hayman, for example: after breaking his arm six weeks before Paris-Roubaix in 2016, he maintained his fitness and form using Zwift, and won the cobbled classic as a result. Seven weeks after my accident, I found myself in a similar position – on the brink of my comeback. Nervous and uncertain, I confronted my fears and lined up in the start chute of the PPA Tiletoria Elgin 70km MTB Race. And despite the corrugations, discomfort and pain, I pushed through; and surprised myself with a top-ten position, among professional riders. Was this all because of Zwift? Possibly. Not only did the seven weeks I spend suffering on the indoor trainer raise my functional threshold power quite substantially; more importantly, it taught me discipline, and how to get over the mental hurdles often inflicted by the mind. It changed me – and it showed me that to get better, you need to leave your comfort zone and endure the pain on the other side. RELATED: I Zwift, And I Like It! I’m just thankful I had the Zwift platform to motivate me and keep me entertained. Without it, I doubt I’d still be riding today, if I’m honest. Zwift is an amazing tool: it’s revolutionised cycling the world over, for the better, and it can work for you too. You do need to invest in a quality smart trainer – and you need to commit to your goals, never surrender to the voice that tells you otherwise, and keep chiselling away. You’ll come back stronger, that’s for sure. 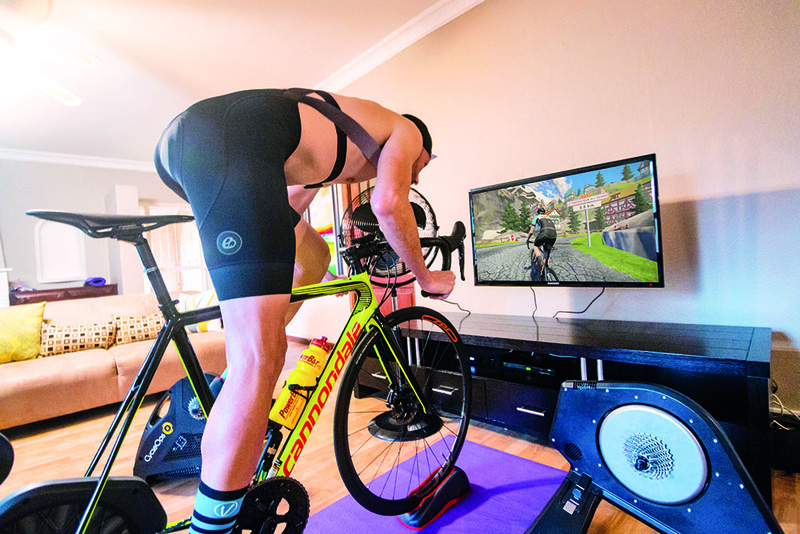 Since the release of Zwift in 2014, we’ve seen an increase in the number of indoor trainers on the market. Often called ‘Turbos’, they enable many cyclists to train indoors despite time constraints or bad weather. From a coaching perspective, these trainers are very useful. There are several that provide accurate and reliable power measurements, which enable athletes to train indoors in a controlled environment rather than exposing themselves to inclement weather and dangerous conditions. Another major advantage: they’re a platform for individuals with limited time to do quality sessions. The word ‘quality’ is often thrown around when we talk about training, and one of the most common sayings in cycling training is ‘quality over quantity’. This is undoubtedly true; however, we have seen individuals emphasising only the ‘quality’ of interval sessions. While these sessions are vital, putting in a quality session in a low-intensity training ride is just as important. For people with time constraints, indoor cycling provides an opportunity to complete structured training sessions or intervals by riding under constant load, whether power- or heart-rate-based. With low-intensity sessions there is often no freewheeling, which allows you to complete a quality session in a shorter time. Combining these trainers with Zwift has enabled coaches and riders to plan their training schedules according to their time availability. For instance, Zwift allows you to upload a session and then automatically takes you through the workout, with countdown timers for intervals. This beats having to memorise your training session and time it manually, and your file can then be uploaded directly to platforms such as Training Peaks to be analysed. 1. Buy a smart trainer. 2. Download the Zwift app, create a profile, and enter your data. 3. Ensure you have an iPad, smart TV, laptop or smartphone, to run everything on. 4. Pair your devices (heart-rate monitor, cadence sensor and smart trainer) using Bluetooth or Ant+. 5. Get a fan. You’ll need it. A towel, too. 6. What are you waiting for? Go and ride. Italian company Elite have been producing cycling products for years; but it’s their smart trainers that have put their name in lights recently. The Elite Direto can simulate slopes of up to 14%, has a maximum output of 1400W, and has a close-to-real-life feel, thanks to the 4.2kg flywheel. It’s also compatible with both road and mountain bikes – boost-equipped rigs included. Its trump card? Not only do several pro outfits use it for its accurate power readings; just look at that price. Aesthetically the Neo is all visual drama, unlike any of its rivals. It looks like a spaceship, and folds out like a flaring Dilophosaurus. Where the Neo really stands out is in its ability to mimic some of the sensations of riding outside, such as riding over cobbles, dirt roads or wooden decks – particularly when used on the virtual courses of Zwift. It feels real, too, and the unit flexes from side to side just like a bike would. Its only downside is its lack of compatibility with certain disc-equipped bikes. With its incredibly smooth and accurate feel, the Wahoo Kickr has become the go-to smart trainer here in South Africa. But as impressive as the ride feel is, the big story here is the lack of noise – even during max efforts. 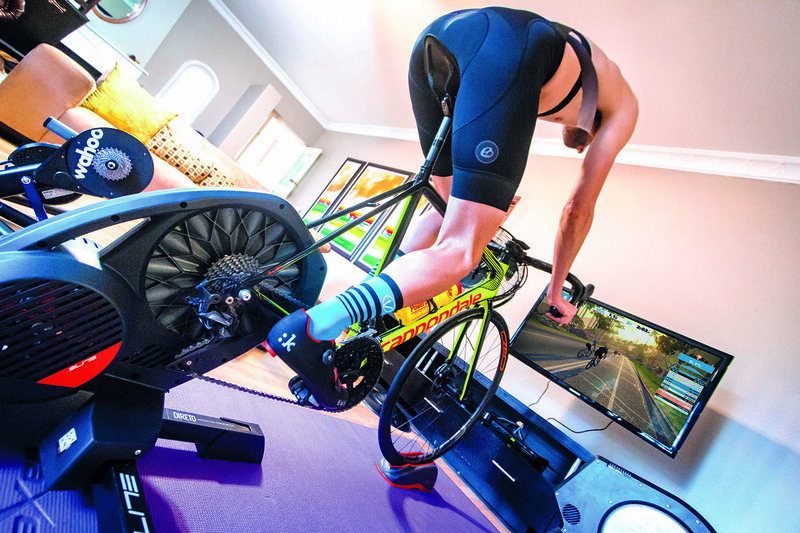 A slew of new add-on paraphernalia has just been launched by Wahoo, including the Climb (bolts to your fork, and moves the bike up and down during third-party workouts in Zwift) and Headwind (a smart fan that controls airflow during workouts). CycleOps is a reputable brand, with decades of experience manufacturing power meters under the PowerTap label. 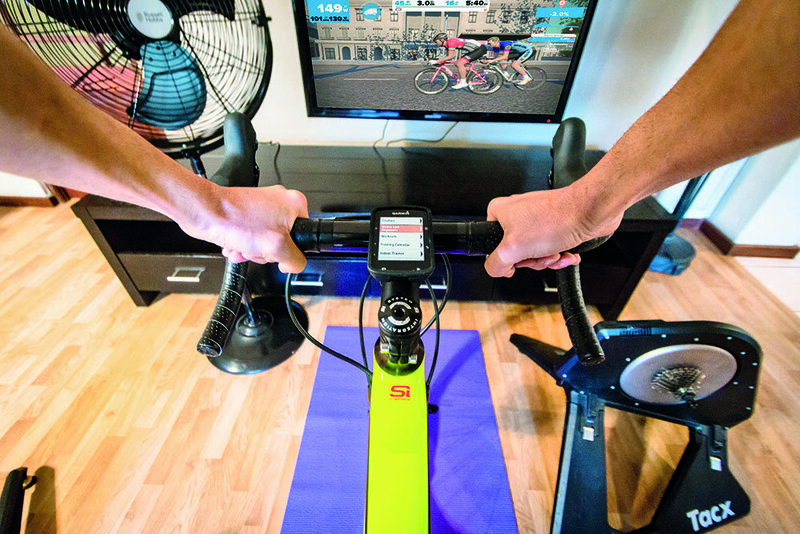 The Hammer direct-drive smart trainer builds on this reputation with the ability not only to measure power, but also to wirelessly control resistance in sync with third-party apps such as Zwift. It’s a refined machine, but also falls short when it comes to accommodating certain disc-brake bikes.